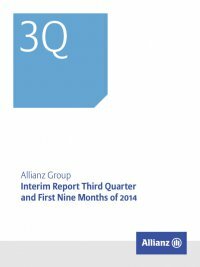 Interim Report Third Quarter and First Nine Months of 2014 Allianz Group18 Property-Casualty insurance operations by reportable segments – third quarter Property-Casualty insurance operations by reportable segments € mn Gross premiums written Premiums earned (net) Operating profit (loss) internal1 three months ended 30 September 2014 2013 2014 2013 2014 2013 2014 2013 Germany2 1,979 1,885 1,963 1,886 2,016 1,912 350 23 Switzerland 259 261 254 261 354 349 39 51 Austria 209 210 209 210 207 210 15 17 German Speaking Countries2 2,447 2,361 2,426 2,357 2,576 2,470 404 86 Italy3 933 853 848 853 971 997 274 353 France 962 963 962 963 988 968 141 83 Benelux4 245 254 245 253 262 271 25 21 Turkey5 218 244 240 244 229 241 30 37 Greece 25 28 25 28 23 23 3 6 Africa 21 18 21 18 16 14 4 1 Western & Southern Europe6 2,406 2,360 2,342 2,360 2,490 2,514 480 503 Latin America 581 543 622 543 427 419 (38) 30 Spain 437 416 437 416 459 459 69 57 Portugal 67 64 67 64 69 67 5 6 Iberia & Latin America 1,086 1,023 1,127 1,023 955 946 37 93 United States 612 652 613 652 569 608 (151) 36 USA 612 652 613 652 569 608 (151) 36 ­­Allianz Global Corporate & Specialty 1,365 1,239 1,367 1,239 817 767 172 164 Reinsurance PC 833 703 833 701 774 718 103 2 Australia 799 750 791 750 575 540 84 102 United Kingdom 690 542 641 542 639 533 67 50 Credit Insurance 530 471 504 467 366 352 71 81 Ireland 106 97 106 97 100 91 13 14 Global Insurance Lines & Anglo Markets7 4,321 3,802 4,241 3,796 3,271 2,999 513 406 Russia 115 221 128 221 143 155 (21) (1) Poland 101 103 100 103 89 86 4 4 Hungary 61 65 64 65 56 58 5 10 Slovakia 80 76 80 76 68 68 11 16 Czech Republic 71 67 76 67 63 60 11 25 Romania 48 43 48 43 41 39 3 1 Bulgaria 22 17 22 17 17 15 (6) 4 Croatia 21 23 21 23 19 20 1 3 Ukraine 3 3 4 3 2 2 1 – Central and Eastern Europe8 522 618 542 618 498 502 6 62 Asia-Pacific 201 161 202 161 116 95 17 17 Middle East and North Africa 16 15 16 15 12 12 2 2 Growth Markets 739 795 760 795 627 609 25 80 ­Allianz Global Assistance 534 497 533 497 545 505 27 32 ­Allianz Worldwide Care 107 88 107 88 131 108 13 8 Allianz Worldwide Partners9 656 599 655 599 691 621 28 29 Consolidation and Other10,11 (1,013) (942) (1,015) (938) – – 86 2 Total 11,254 10,650 11,149 10,645 11,180 10,768 1,422 1,235 1 This reflects gross premiums written on an internal basis, adjusted for foreign currency translation and (de-)consolidation effects. 2 Starting from 2014 “Münchener und Magdeburger Agrarversicherung AG” is included in Germany with gross premiums written of € 2 mn, premiums earned (net) of € (1) mn and operating loss of € 2 mn. Prior period figures were not adjusted. Contribution to German Speaking Countries before consolidation in 2013 was gross written premiums of € 4 mn, premiums earned (net) of € (1) mn and operating loss of € 5 mn. 3 Effective 1 July 2014, the ­Allianz Group acquired specific distribution activities of the Property-Casualty insurance business of UnipolSai Assicurazioni S.p.A., Bologna (“Distribution Activities”). 4 Belgium and the Netherlands are presented as the combined region Benelux. All prior periods are presented accordingly. 5 On 12 July 2013, ­Allianz Group acquired Yapı Kredi Bank’s shareholding in the Turkish property-casualty insurance company Yapı Kredi Sigorta. 6 Contains € 2 mn and € 2 mn operating profit for 2014 and 2013, respectively, from a management holding located in Luxembourg. 7 Contains € 4 MN operating profit and € 7 mn operating loss for 2014 and 2013, respectively, from AGF UK.